True peace comes when you and I have peace with God. We often see those who seemingly have a calm, cool and collected demeanor in all aspects of their life. But then, a loss, a setback and they fall apart. In some cases, do something to harm themselves or others. We wonder what drove them to such a hasty and destructive decision and more often than not, we find that they had been living in an unsettling situation. A private hell. As I read this today, I thought of the times when my life could’ve came unraveled. The times when things seemed so overwhelming that I knew that the Ol’ smutty face was right there saying, “Why don’t you just end it? You’d be doing everyone else a favor. It would be the easiest way to clean up the mess, make the pain stop and end the loneliness.” But can I say, Thanks be to God I didn’t! I would’ve missed so much! Being a parent, a grandparent, growing deeper and more in love with my wife and children and most importantly – my God! The ability to lead souls to Christ, preach the gospel, sing His wonderful praises, meet some of the most wonderful friends and brothers and sisters in Christ – all would’ve been missed. At times when I felt most alone, it was often because I neglected to realize the truth of the Word of God. How many times have I heard the voice of the sweet Spirit of God say to me how much I’m loved; my sins are forgiven; and how I am significant to Him – not because of what I DO, but who I AM to Him?! Only Jesus can give true peace. In times of greatest trial, I have felt His presence close by. At times when I felt most alone, it was often because I neglected to realize the truth of the Word of God. Hebrews 13:5 for he hath said, I will never leave thee, nor forsake thee. Over and over God comes to reassure us that He is there. To everyone who has, by faith, received the Lord Jesus Christ as their personal Savior. We have the very Word of God, the promise of Heaven and the assurance of His presence given to us in earnest with the indwelling of the Holy Spirit of God. There is no more significant event in all of mankind than the resurrection of Jesus Christ. This Sunday, around the world, we will celebrate the resurrection of Jesus Christ. There is no more significant event in all of mankind than this day. How we mark time changed from BC (before Christ) to AD (Anno Domini – in the year of our Lord). The prophecies of the Old Testament were fulfilled and the promises of Christ have rang true through the ages. But I am also very much aware of what my Savior had to go through to get to that day He rose from the dead victorious. There was the betrayal of Judas, the denial by Peter, and the cruel handling at the hands of the Roman guards. Beaten, bloodied, mocked, spat upon and made to be their bloodlust plaything. These men were without heart or care for human life – their job was to exact pain, torture, and death. They were devoid of compassion, absent of love or feeling. The torture of their own soul was taken out on others. Through the cruelest of implements, man and the devil could devise. All of the world’s sins – past present and future placed upon Him. Therefore, the final act of His will was in submission to the will of the Father. Giving in to it meant bodily pain, emotional devastation and spiritual separation from everyone and everything. All of the world’s sins – past present and future placed upon Him; His Father turning His back on His own Son. The utter loneliness of what He had to do and where He had to go all could have derailed the plan of God to redeem man… But it didn’t! Whether at salvation to have our eternity secured, or through this life by experiencing His presence. Cleansed, humble, submissive and desiring His presence – whatever takes me from that place needs to be my enemy. Sin and self will rise up and take our hearts away from the very things God designed to draw us to Himself. The comfort of His presence will be in the churches this Sunday. IF God’s people will bring a spirit and desire for His presence to celebrate the resurrection. Whatever you do, do not forsake the assembling of ourselves together. Furthermore, invite someone you know who needs the true peace of God. As a result, you will see what God can do in and through that gathering. Celebrate this Resurrection Sunday, and don’t forget to invite someone who needs that true peace that only God can give! 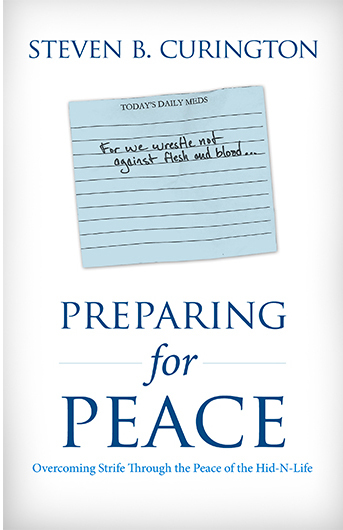 Check out Steve Curington’s Book, Preparing for Peace!